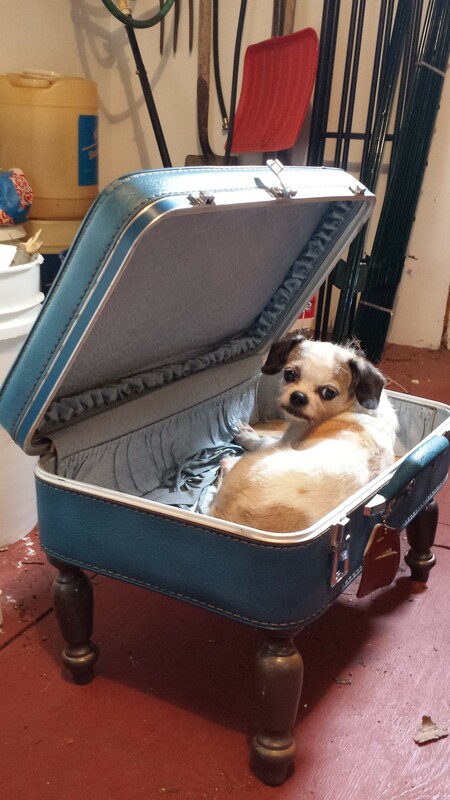 Several years ago I inherited a couple of ugly old school suitcases from my grandmother’s estate. Personally, I loved them and knew I would find a use for them. Initially I built a stand and used them as a nightstand / storage unit, but then I saw some posts about using them to make cat furniture. Well that settled that. 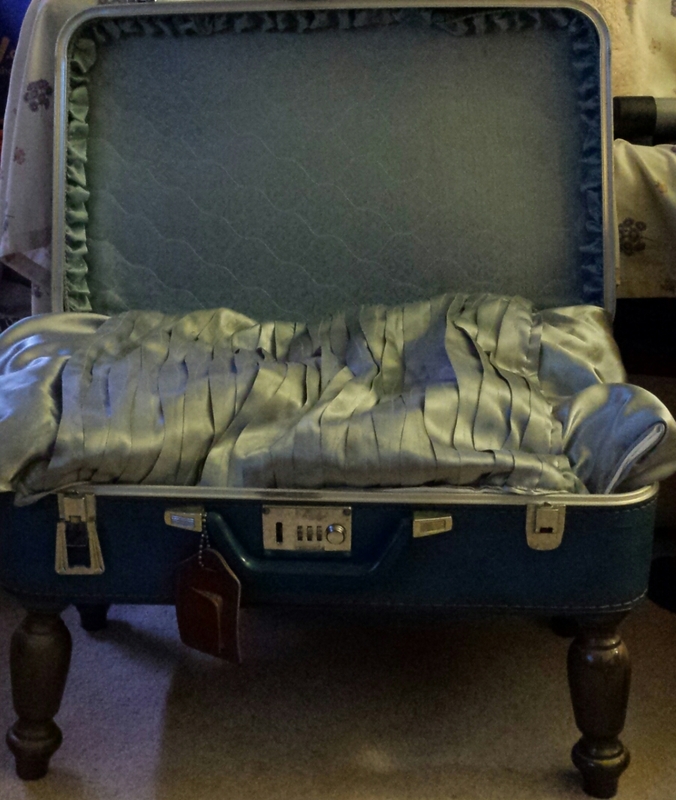 I first set the suitcase on the floor to see if the cats would actually use the bed. As you can see from the picture below, Freddie in particular loved it. I thought it looked a bit plain just sitting on the floor and I was nervous that they would knock the ugly stick over and decapitate themselves like my hamster did when I was a kid (side note, don’t use a brick to keep your hamster’s cage cover on), so I headed to the hardware store to find some legs. Turns out legs are expensive so I picked the cheapest of the ones I liked (4 for around $12 total) and spray painted them with some metallic paint I had laying around. 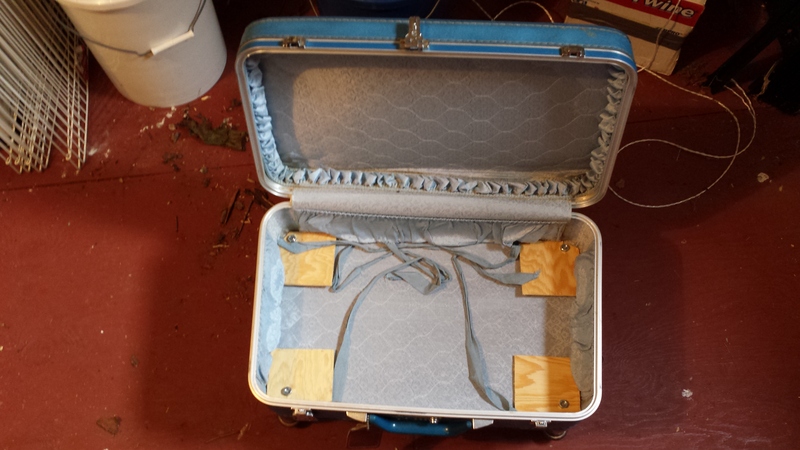 I first tried to just attach them to the suitcase by drilling four holes in the bottom and sticking them in, but this resulted in no stability – the suitcase just collapsed to the floor. I had to wait until the weekend when I would see my dad, so I could steal, I mean borrow and never give back, a few pieces of wood and a saw. Okay, okay, I admit it. As usual, when my dad knew I was doing a project that involved sawing, he stepped in and helped me out…..okay okay, he did it for me….but I stood there and watched! 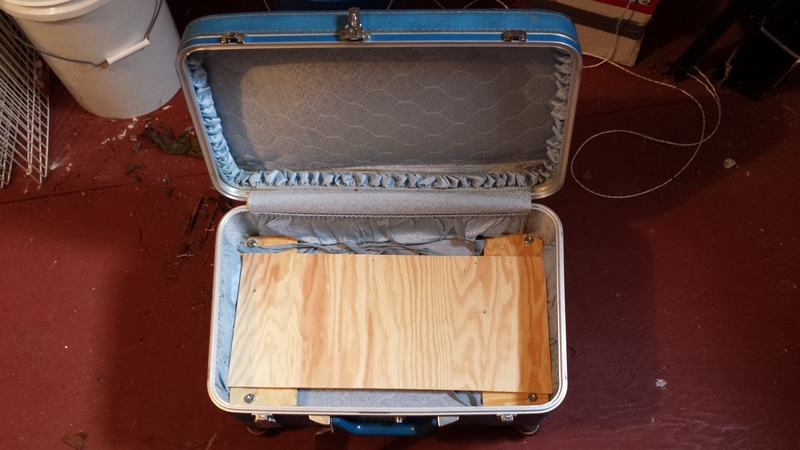 My idea was to cut four pieces of wood and place them inside of the suitcase to stabilize the material. My dad, the genius handyman that he is, pointed out without nuts, it would still wobble. Off to the hardware store we went. With the proper tools, the rest of the project went pretty quickly. He even cut another piece of wood to lay on top of the four stabilizers so that the cats would have a flatter surface to lay on in case they pushed the pillow out of the way. Yay Daddy! To ensure the lid didn’t decapitate the cats, we wedged a few pieces of wood in the hollow space between the top and the bottom pieces. The final step in this process was to enlarge the pillow I was planning on using. 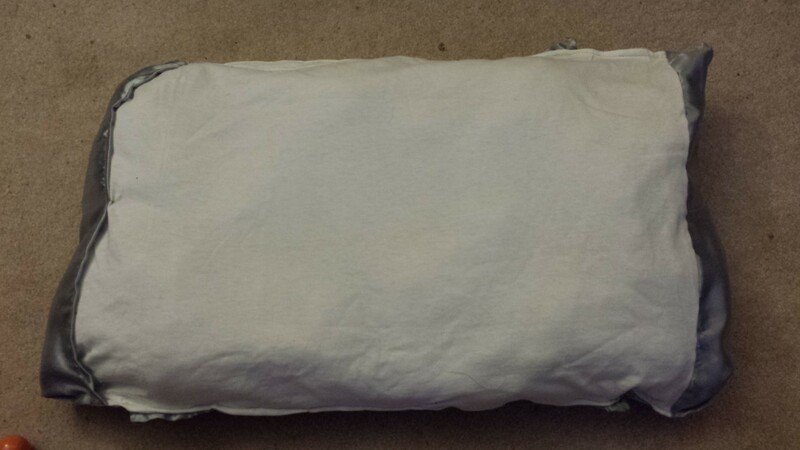 I cut open the back of the pillow and sewed on a piece of old t-shirt. 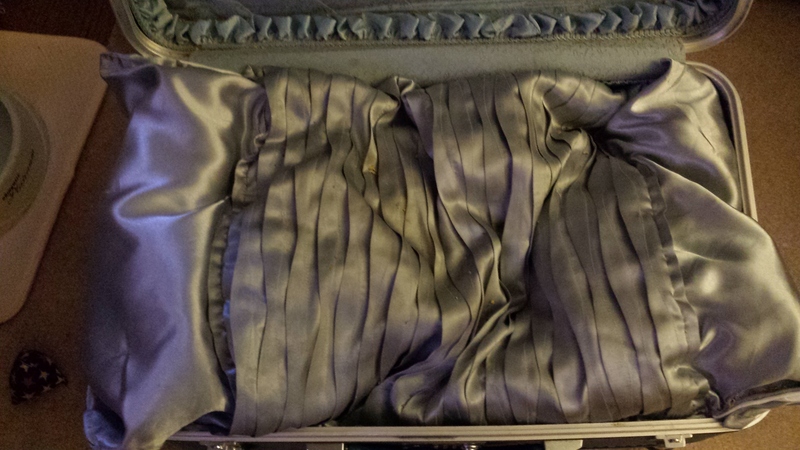 This way the top shows the pretty satin blue colored fabric, but the entire suitcase and edges would be comfy. PS My parents’ dog, Jack, liked the bed just fine, so maybe I should give it to him for Christmas! 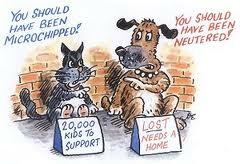 Microchips – may be the only way to find your lost pet! Recently, I started volunteering at my local animal shelter. I have learned many things – like how much work goes into caring for these animals. Their cages are constantly cleaned, they are walked at least three times per day, fed twice a day, medicine given, vet visits, socialization, etc. I also learned that they don’t do anything to help you find your lost animal. In my mind, I envisioned that if a shelter receives an animal that was found as a stray, it would post it up on its website, send out a notice to local vets, and post on a lost pet page. They do none of this! Instead, they hold your animal for 7 days and then release it to be adopted. I asked how a person is supposed to find their pet as I didn’t even know this shelter existed up until a few weeks ago. I was told that when you lose your pet, you should go to the police station and tell them about your pet, and they should give you the information of the shelter that should have picked it up if it was found on the street. Now I find this to be ridiculous. What if your pet wandered over to the other town? What if it was picked up by someone in a car and driven to their local shelter? There has to be a better way. I realize everyone is overwhelmed but at my orientation, there were two other people who offered to do office work for the shelter. Couldn’t these people take on the task of getting the word out there that an animal was picked up? I am going to try to get this process improved at my shelter, but if it’s not happening there, I’m guessing that it is not happening at many other shelters around the country. Well, if you have been following my blog, you know that I only go hiking with my two Chihuahuas, Eli and Mimi. This weekend I learned that I am a bad mommy. This is what happened to my poor little girl! 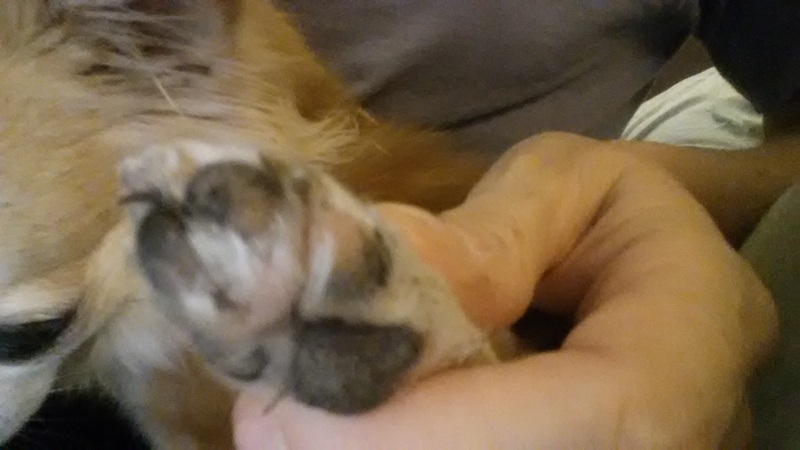 I inspected the rest of her paws and they are all looking pretty ragged. I put some neosporin on the bare pad and a bandaid around her foot to help aid healing. She is good and does not bite on the bandage. I also have purchased a paw protector salve that should help healing and also will give her protection against the elements outdoors. I will use this from now on when we go hiking as her paws obviously cannot take the wear and tear of so many miles! My girl is delicate. I have to remember to treat her that way! 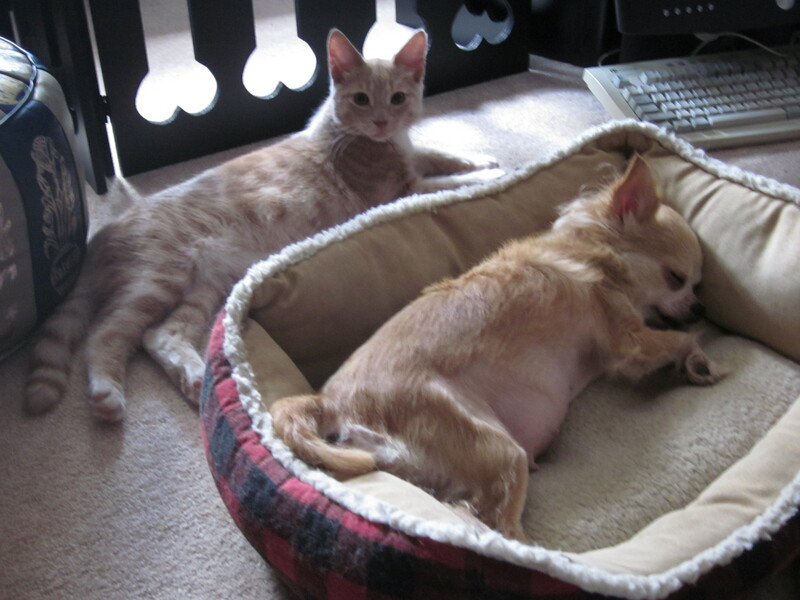 Two years ago this month, I became mom to an interesting couple of animals – Mimi the dog and Milo the cat. However, their story started 5 months before I even came into the picture. 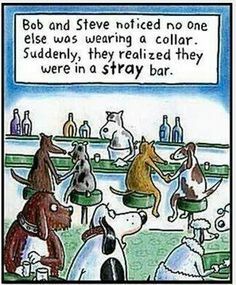 You see, I belong to a Chihuahua meetup group that also assists in rescuing Chihuahuas in need. 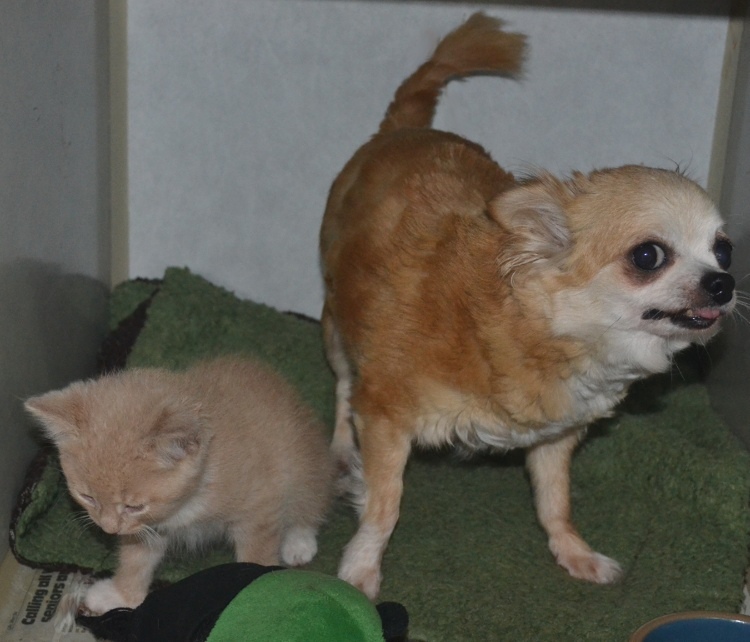 A Facebook post by Ada Nieves about a Chihuahua and kitten that needed a home caught my eye. My family already consisted of two 12 year old cats – one with chronic sinusitis and the other an anti-social 22 pounder, a 5 year old Chihuahua and an 18 year old turtle. Most people would think my house was full, but I knew there was a piece missing. I debated on adopting a playmate for the dog or a social cat for my lonely cat but was having trouble deciding. When I read Ada’s post, I thought that it may be the answer to my problem. I could help keep the pair together and finally stop worrying about making the wrong choice. 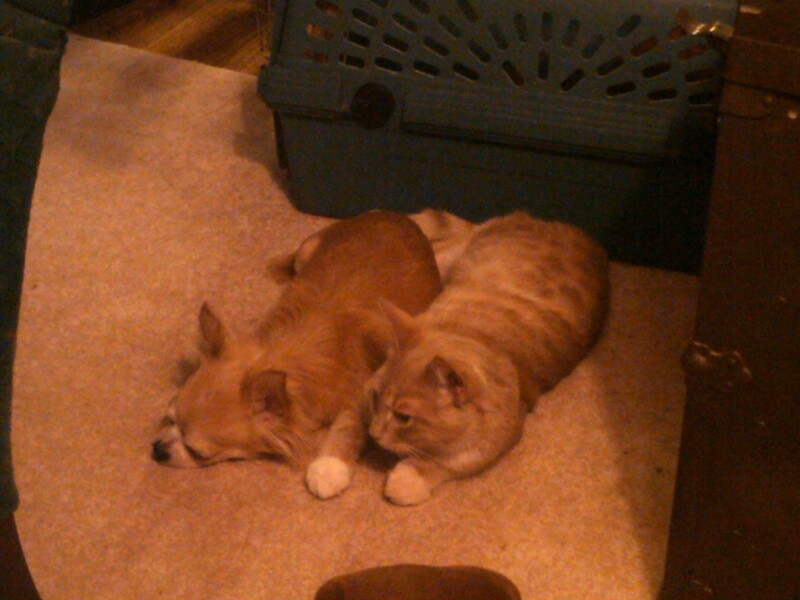 The story of why Mimi and Milo needed to stay together is more than just animals getting along. 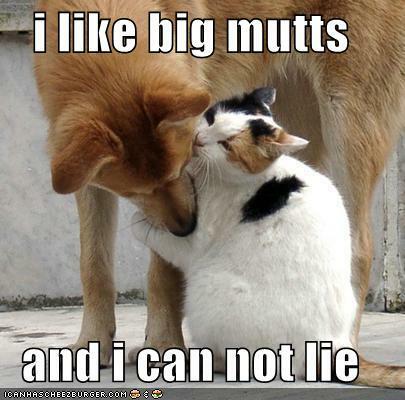 Mimi had become a surrogate mother for Milo (then named Rover). I will start from the beginning….. 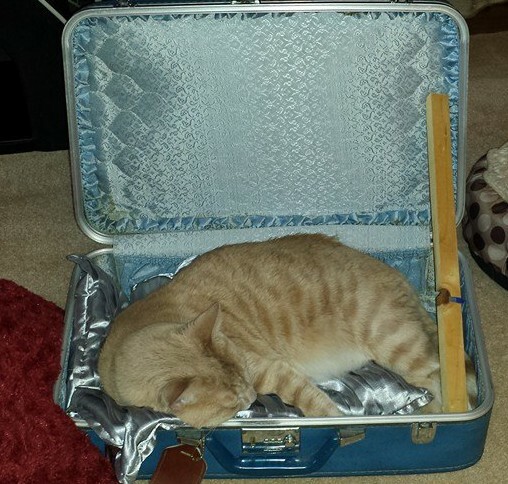 In the Spring of 2012, a lady named Jen took in two little furbabies as she is known to do; however, this time she didn’t realize what an adventure she was setting out on. Mimi was taken in by Jen and her husband after her original mom became critically ill while Mimi was pregnant and was no longer able to care for her. She had a c-section because she only had one puppy in the womb, and unfortunately her puppy was not born alive. The week before they brought Mimi home, Rover was brought into her sister’s grooming salon by a man who said his Mastiffs brought him the kitten! Rover barely had his eyes open, so they hand-fed him until the next week when Mimi arrived. Mimi seemed very depressed, so they offered her the tiny kitten. 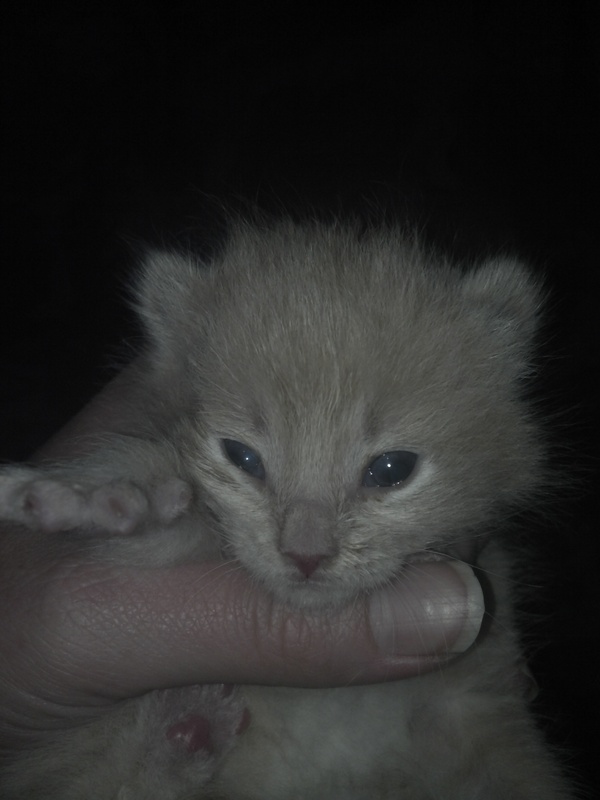 It was instant love – proven when she started to nurse him. Rover played so gently with her and their bond was amazing…they truly loved each other. It was then that Jen knew that this pair could never be separated. She set on a quest to find them a furever home. Through Ada, she searched high and low to find them the perfect placement. However, Mimi’s troubles were far from over. Later during her spay surgery in August, she developed a hernia along her spay incision, so yet another surgery was required. She actually developed an additional hernia right after I adopted her and needed another surgery then as well – that’s 3 surgeries in one month if you’re counting! Anyway, while Mimi healed from the first hernia surgery, Jen and I had many conversations to make sure my home was the right one for Mimi and Rover. Fortunately for me, she thought we would fit well together, and I was able to complete my furry family! We each drove many hours to meet halfway between our homes and ended up meeting in a McDonald’s parking lot! Yup… I’m lovin’ it! When I finally arrived back home, I was worried about how they would adapt to their new surroundings and siblings and vice versa but everyone tolerated each other well right from the start. I could tell that Mimi and Milo (Rover was a good name for the tough guy at the beginning but now he was a mush and needed a mushy name like Milo!) were completely bonded and inseparable. They would sleep in the same bed and many nights I was woken up by the sounds of Milo still nursing on Mimi – 5 months later! It’s two years later, and their bond is as strong as ever. 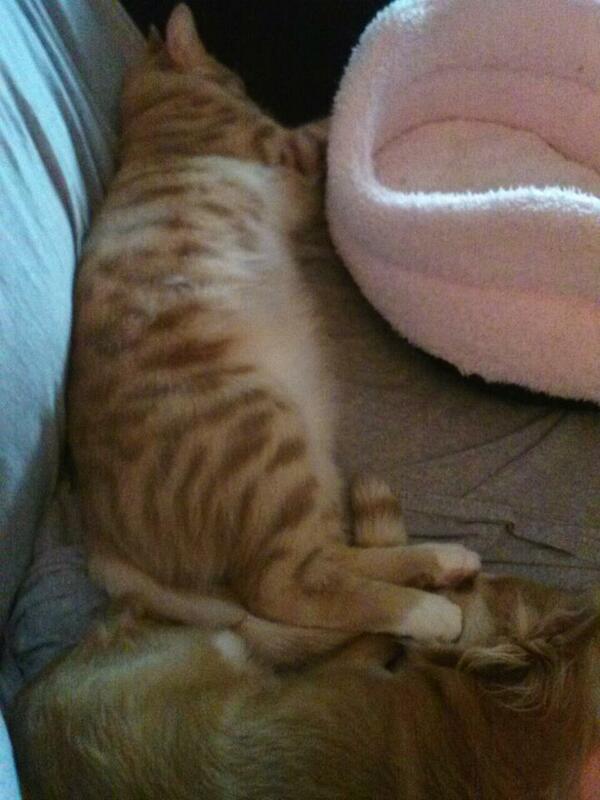 Milo is now twice as big as Mimi, but he plays with her like they are the same size. 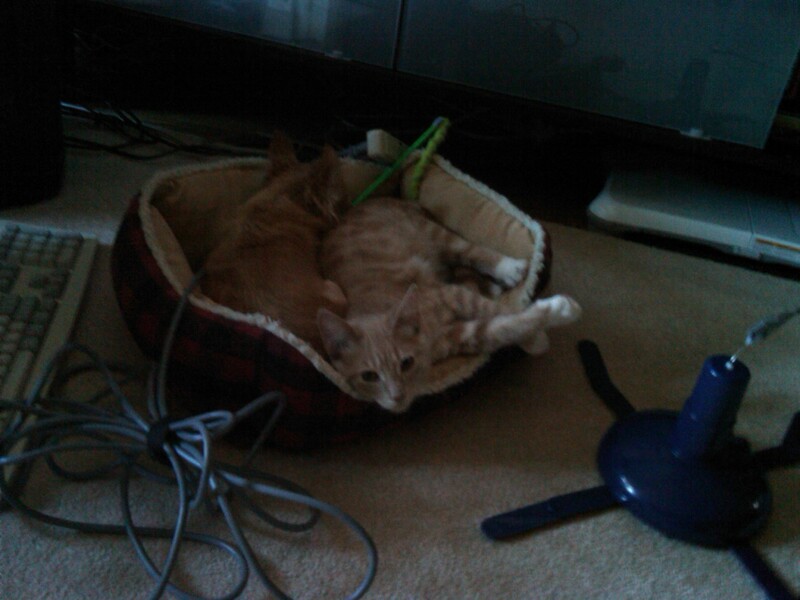 Mimi and Milo have completely settled into their new digs. Milo has taken his place as the bratty little brother and chases around the older cats, and Mimi has taught her Chihuahua brother how to be a nicer guy. In Jen’s words: Milo is like the perfect mix of cat and dog, and Mimi is just a ray of sunshine. 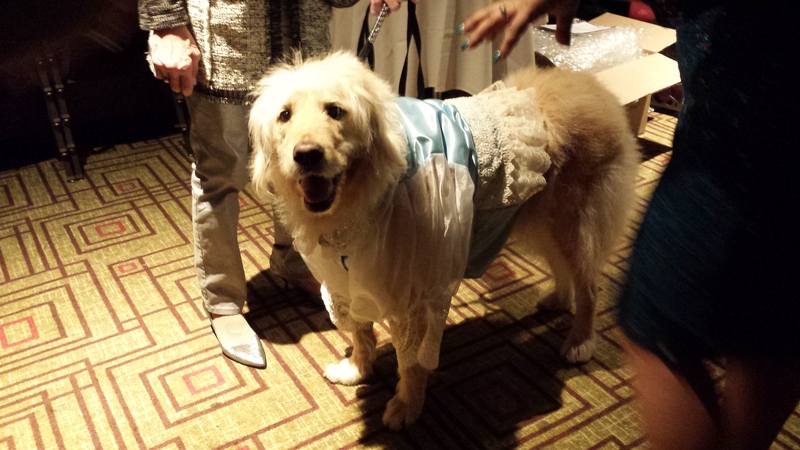 Mimi is now a therapy dog bringing smiles to residents of physical rehabilitation centers, and Milo helps raise money for animal charities by starring in the annual cat fashion show at the Algonquin Hotel in New York City. They love to cuddle and sleep near each other. 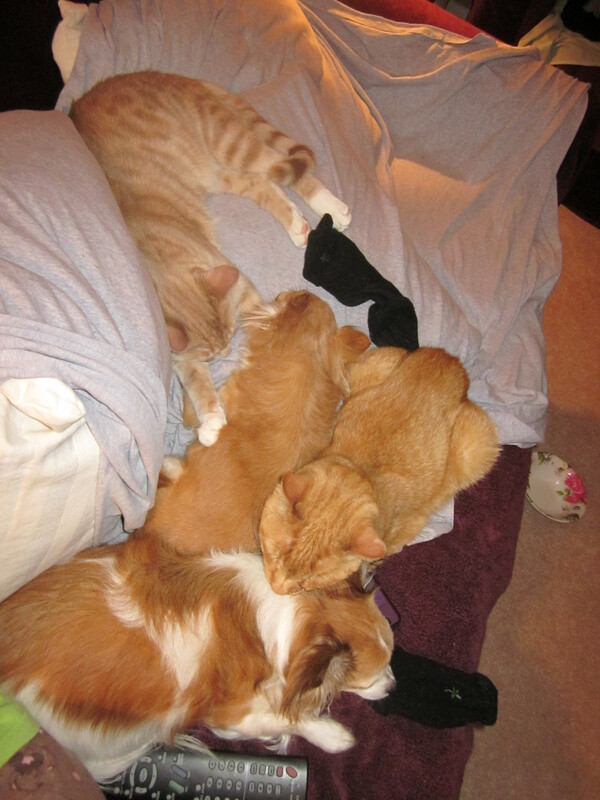 I love this pic of them sleeping with Milo’s feet on Mimi’s face! But alas the point of this blog is twofold. The day I put Simon to sleep was one of the hardest in my life. I knew I was doing the right thing. I believe Simon agreed. It didn’t make it any easier. I was fortunate to have my then boyfriend with me to drive us to the vet. I had one last chat with the vet to confirm we had tried everything and then we went into the back room. The room was sterile and cold. He took Simon from me and laid him on the table. He was given a sedative so he wouldn’t be scared. Simon just laid there, calm and still. I said my goodbyes and let the vet do his job. I stayed with him the whole time and knew it was over when his eyes glazed over. It was so quick and I’m told painless. …. at least for Simon. I sobbed and sobbed and had to leave the boyfriend with my credit card to pay the bill. I sat in the car and cried. …I got home and cried. ..All day I just sat in my lonely house where Simon used to be happy and free. Well I guess he was then in a new place to be happy and free. But this is where I come to the second part of my story. As I sat on the couch mourning my loss, I heard a sound at the window. 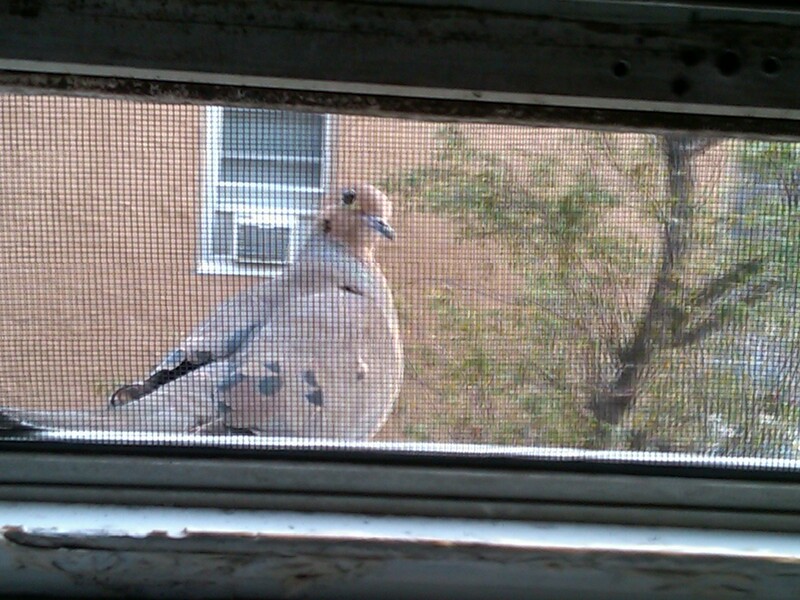 It was a mourning dove on the fire escape. I had never seen one there before and this one just stayed watching me singing its song. Now you don’t believe me, but I really feel that Simon’s spirit was in that bird. It gave me comfort when I most needed it and has continued to comfort me to this day. Doves have continued to perch on the fire escape. …. sometimes more than one at a time. I learned that they are common in this area, but I never saw one before that day. 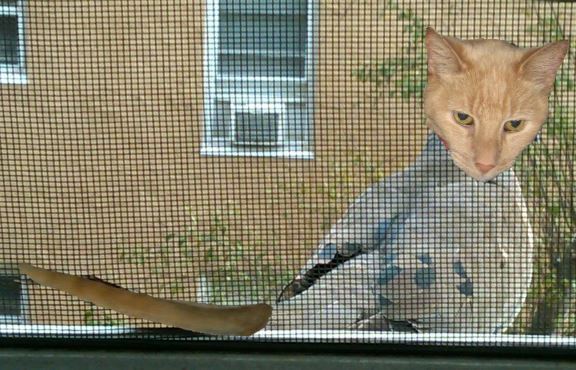 The birds sit outside my window even though my dogs bark and the cats sit and watch them. I just know that Simon sends these birds. Go ahead. ….. think I’m crazy. ….. but I know I’m right. I searched for months to adopt my dog. I saw dog after dog at foster houses and was rejected from all of them for nonsense reasons like I was single, I worked a full-time job, I live in an apartment, I didn’t have a backyard. I wasn’t looking to adopt a huge dog. I wanted a medium to small dog that would have room to run in an apartment. The whole process was long and frustrating. I spent many nights upset over all the time I wasted trying to get people to give me a dog. I was a great candidate with years of dog and cat experience, came with great references, had a good job, owned an apartment in the city and a house in the country…..but that wasn’t good enough. This experience got me thinking about how some shelters are run. Obviously, many of them are overcrowded so fostering is great, and I understand that you get attached to the pet in your care; however, sometimes you have to let them go to their new furever home. The goal of shelters should be to get pets into good homes – not necessarily the absolutely perfect home. Here are some ideas I had that I think would help get more animals adopted. First it’s all about how the animals are presented. Do they have a good name? A great photo? If not, start there. If you don’t have a great photographer on staff or as a volunteer, post an ad on Craigslist for an amateur photographer looking to get their name out there. Have them photograph your animals. Reward them with credit for the photos and be a great reference for them. Set up a small area with a nice backdrop to be your permanent photo area. Animals do not look their best in cages. Take the extra minute to photograph them elsewhere. Perhaps have them sit on a chair. Get on their level. I am not a photographer so I don’t have lots of tips for this but there are many sites out there that do. Check out this site for a good start. (or another less complicated program) and throw a hat or caption on a picture – especially if you don’t have a great picture of the animal. Don’t have time for this? Recruit an intern who can work on this task from home. On that same thought, use that intern to spice up your listings. Make them funny and interesting. You have to get the viewer to connect with this animal and all you have is a picture and words. Take the extra time to post something fantastic. You can always recycle verbiage from animals that have already been adopted to save time. Organize! Use your computer. Print as much information about the animal as possible on an index card size paper and attach it to their cage. 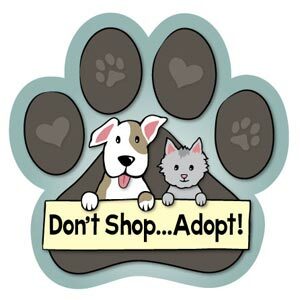 This way potential adopters will know as much as possible about the animals they are viewing. You can cheaply add and replace information by attaching paper to the cage via a clothespin. Use a border and a nice font. Include language that will connect the animal to your potential adopter instead of just bullet points. Something like “Hi, My name is Misty. 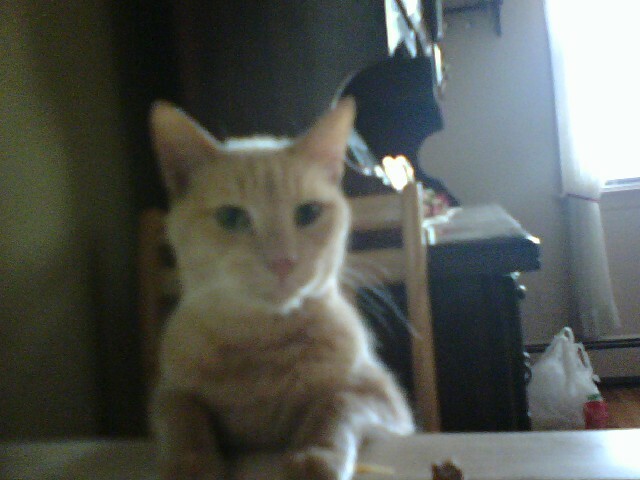 I love other cats and dogs but little children scare me. I’m 8 years old and love to be tickled under the chin. I’d love to become part of your family.” Include a great photo of the animal in case they are hiding in the back of the cage. Make it easier for people to volunteer at your shelter. I tried to volunteer at several shelters and had to jump through hoops just to get a response. I never felt like they wanted or needed my help even though their website asked for volunteers. In the end, I chose to volunteer elsewhere where I felt appreciated. Shelter hours – Hours that people can visit pets after work and on the weekend are a must! Having hoards of people come into your shelter during the couple of hours you are open on a Saturday is just not a great way to get your animals in front of people. I realize that shelters are often short-staffed, but getting people in is how animals get adopted! Make it convenient. 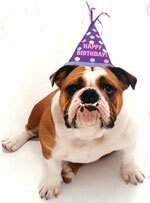 Animals will be less stressed when viewed by fewer people at one time as well. made out of things they already own, or if there is a woodshop class, they can construct some that are even fancier – perhaps for sale at your shelter or for auction at an adoption event. See some options here and here and here! Dog toys are also an option for group projects. If you can’t get local schools on board, perhaps schedule a night out at a bar or restaurant. Have tools and supplies on hand and ask participants to bring supplies as well – old shirts, tennis balls, etc. Here are some ideas for homemade toys. Some of those toys are easy enough for elementary schools to create. Projects are great ways to keep kids occupied on rainy days – instead of just plopping them in front of a television. 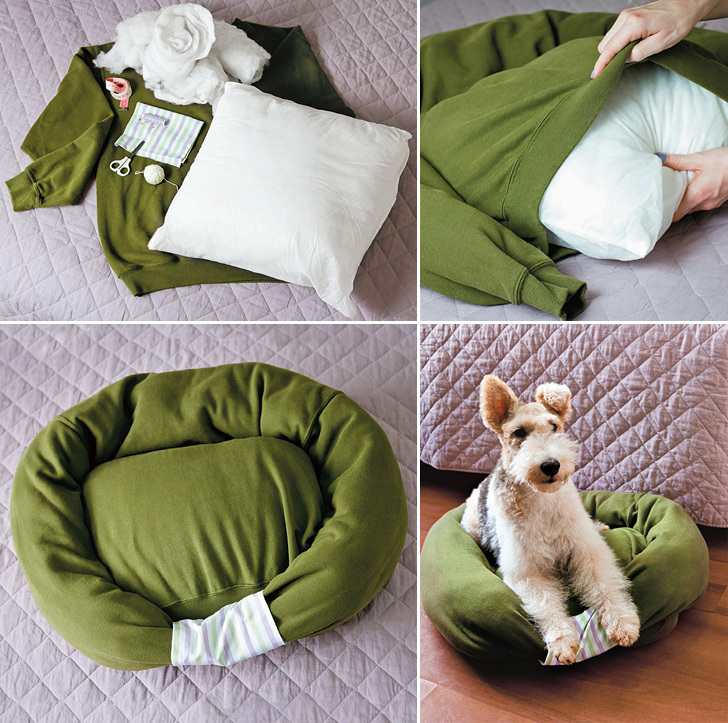 Make an Amazon wish list to allow people to buy specific items for your shelter. Keep active on social media. Show both success stories and animals still in need of homes. It’s amazing how people will pull together to get your animals adopted; it just has to be easy for them to do so. Sorry this list was so long. I feel like I have a million more ideas, but I’ll write them up another time. If you have any ideas of your own or thoughts about mine, please leave a note in the comments section. I would love to be able to help shelters in any way I can. 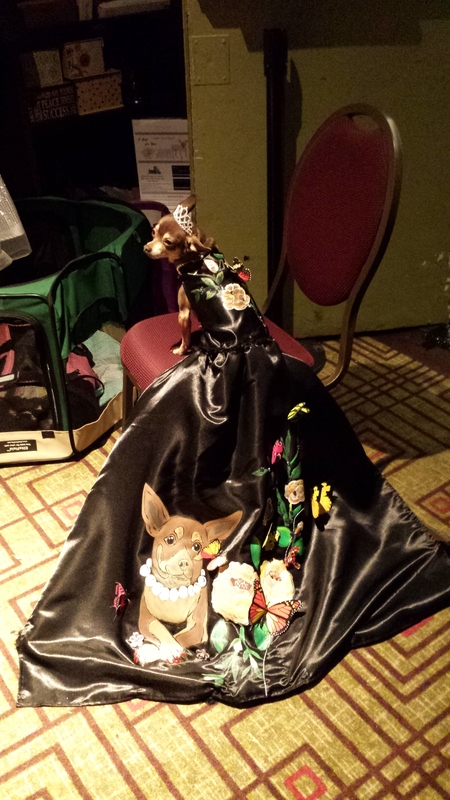 A few weeks ago I had the opportunity to help out backstage at the New York Pet Fashion show . If you have never heard of this event, you should check it out. It sounds a bit crazy, but it is all good fun and this year its proceeds went to the Mayor’s Alliance for NYC’s Animals which is a NY-based charity that helps out over 150 non-profit shelters and rescue groups around the city. Backstage at the Pennsylvania hotel was a show in itself. My main tasks were to help dress the dogs and keep their handlers in line – literally in a line 🙂 The dog were very well-behaved; the people, eh, not so much. 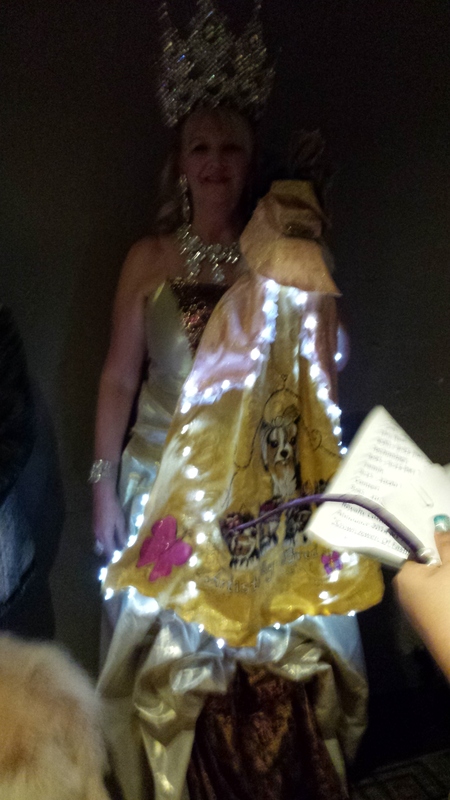 The clothes were amazing – long flowing gowns, tiaras and crowns and LED lights galore! The detailed work that went into these pieces of art was truly amazing. I was in awe of these creations – heck, I can’t even sew Eli’s tuxedo so it will fit him properly! I was so busy that I didn’t get to take many pictures, but here are a few. 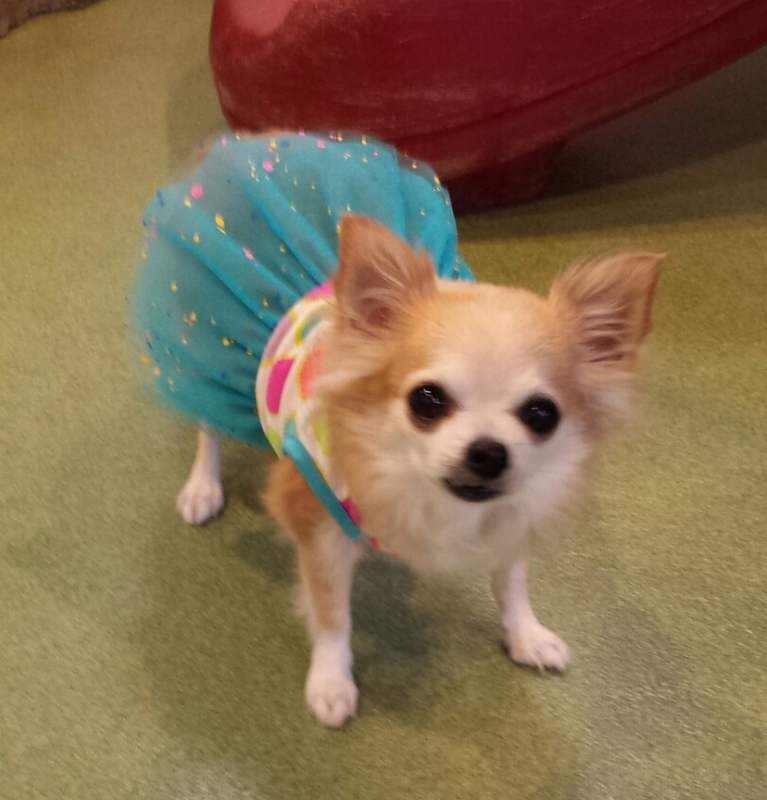 If amazing gowns on dogs are your thing, please Google the show. There are so many great pictures and articles out there about it that I can’t possibly link to them all! Also, please consider donating to the Mayor’s Alliance for NYC’s Animals to help save the lives of many animals across the city and afar. 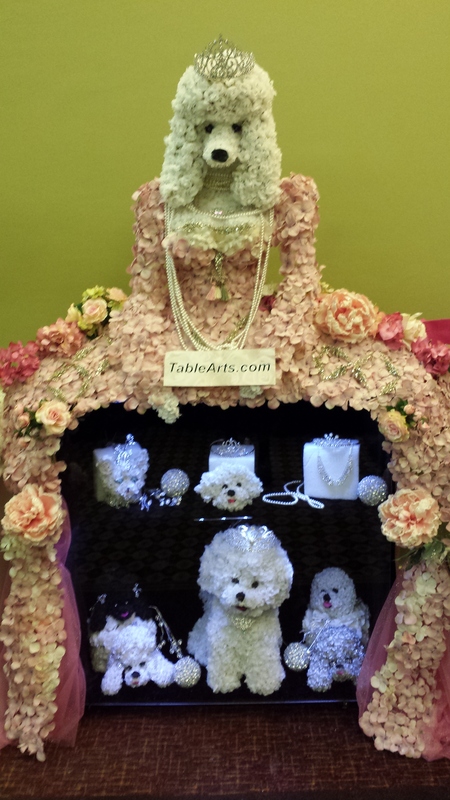 Even the flowers were dogs!